The book “Victorian Bingham” (edited V Henstock) is an excellent reference for life in the 19th century. Comparison of maps and census data has been made easier with the development of computer software over the last few years and the next paragraphs present some analyses resulting from these developments that enlarge on some of the material presented in “Victorian Bingham”. There were now 384 households, compared to 115 in 1776. The population (1841 census) was 1934 (excluding the workhouse) compared with estimates of between 500 and 900 for 1776. Figures 1 and 2 give an indication of family size. The number of people in a household with the same surname varied between 1 and 10, with an average of 4.1. 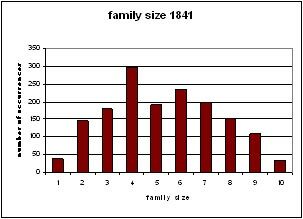 Victorian Bingham (p19) noted an average family size of between 4 and 5. An accurate count is made impossible by the lack of relationship information in the 1841 census. Some will include relatives of the head of the household other than wives and children; others will include children of a different surname who could be step-children. There were 20 households with a child under 10 not of the same name as the main family and without an obvious parent. These would presumably have been children of relatives, either dead or with overcrowded accommodation at their family home. There were also about half a dozen cases of a woman of a different surname with a baby or small child, possibly examples of the nineteenth century habit of sending unmarried pregnant girls away from home. The spread of household size is shown in figures 3 and 4. 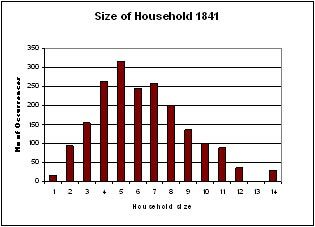 Average household size was 5 people, but there was a significant number of larger households, with 101 (25%) of seven or more. The size of a household is often greater than the number of family members, explained by the number of servants and lodgers. The 1841 census lists 134 servants (85 female and 49 male) – nearly seven percent of the population. But it would be misleading to think that a large number of families were sufficiently well off to afford a servant. 51 (20f, 31m) of them lived in at a farm and were thus more farm hands than personal servants. The rector had 10 (6f, 4m), some of whom may well have worked on the glebe land. 17 were employed in the inns. Seven people of independent means and with no other family member had live-in personal servants - e.g. Diana Horsepool (55) had a servant/companion called Martha Gilling (50) and Anne Foster’s (50) servant was Elizabeth Taylor (20). Another dozen or so were not live-in servants, so we do not know where they worked. The rest were largely employed by tradesmen or shopkeepers, who were probably better off than the rest of the non-farmer population. Even here, some may have been as much shop assistants (not specified as an occupation) but described as personal servants. Relationships were not given in the 1841 census. Many (not just the large) households listed individuals with different surnames to that of the head of household, in many cases three or more. Where there were two surnames it was probably often the case that a family had in-laws living with them. However, examination of additional information (age, occupation etc) frequently suggests another interpretation, namely that these people were lodgers; about 100 could tentatively be so identified. In several cases there were sufficient different surnames for the householder to be considered as operating a lodging house as well as following his or her stated occupation. Christopher Parr, stocking maker of Market Street, with a household of 11 seems to have run a lodging house – there were only 4 family members plus three wandering musicians, another stocking maker, a sawyer and a baker plus a female servant. noted that several lodging houses in Bingham were not registered according to law (introduced 1851, enhanced 1872). Alice Randall of Pinfold Lane Bingham reported as being the habit of using her cottage as a common lodging house without being registered. Resolved to issue notice to comply. By 30th the MOH had visited the cottage and reported the rooms were too small and her application for registration was rejected. In 1881 she was a 69 year old widow living on The Banks. The Pinfold would have been nearly opposite. There were 57 occupants at Workhouse, including staff, but it hardly counts as a household!. The workhouse is ignored in our consideration of life in Bingham, as little research has been done in this area. Those with 12 or 14 were Banks House and Starnhill farmhouses with 6 live in servants each, the rectory with 10 servants, The Kings Head Inn (guests plus servants) and a house in Long Acre which may have bee split into two - there were two whole families. Three households with 11 were all family members – John Mabbott, lace agent in Needham Street; George Gray, Needham Street, a letter carrier; William Porter, stocking maker, Newgate Street. Of the others with 11, John Richmond, Market Street, tailor had 9 family members, an apprentice tailor and a barber. Households of 10 were William Strong, farmer in Market Place had 7 family and three servants; Samuel Scothern, bricklayer of Newgate Street had 9 family plus (probably) mother-in-law. William Morris (ag lab) of Chapel Close (Kirkhill) had 7 family pus three Judsons (father also ag lab). Thomas Lee’s household in Newgate Street Farmhouse was himself (aged 75) and Sarah (45), three servants (two brothers who would have been farm hands) and a family of five Whitlocks – mother Ann (aged 35) and five sons aged 1 – 7. Relationships were not given in the 1841 census so one can only guess that Sarah was his unmarried daughter and Ann his married and (possibly widowed) daughter with his grandchildren. Butcher William Tomkinson’s household of 10 in Market Street was all family. William Smith, cabinet maker of Long Acre (East) had 5 family members, a young cabinet maker aged 15 (John Raynor), a female servant, a shoemaker apprentice, a school mistress and a lace worker (the latter were both Browns). Was this a lodging house? So 5 large households were big houses with servants and one was an inn. 6 had families of 7 or more. Two had such a variety of surnames and occupations that they could have been lodging houses – especially the one with three ‘wandering musicians’! This is summarised by occupation groups in figure 9. Agriculture still accounted for 30% of employment but was becoming rivalled by the various occupations associated with clothing production. The census description of FWK denoted a framework knitter who owned (or rented from an agent) a framework machine generally used in a workshop or room at home. An upstairs room at 4 Long Acre has been identified as such a workshop. Stocking maker denoted a journey man who would be employed by a framework knitter. The high proportion of journeymen suggests there were a number of workshops of more than one machine. One such building still exists in a yard off Market Street, another (now minus its wide windows) is in Newgate Street. Lace runners finished off machine produced items with hand stitched patterns of which machines were not capable. Many were the wives or daughters of framework knitters or stocking makers. The development of dressmaking as an identifiable occupation is indicative of increasing affluence amongst the wealthier classes. Practitioners were generally daughters of ‘respectable’ families (e.g. midwife, saddler, and stonemason) or were lodging in the town and presumably working on their own account. A chevener embroidered fine silk stockings. Cottagers were still in evidence, presumably growing vegetables and other crops for subsistence and sale. Fig 10 lists them.